Despite a few quick redeeming moments, this movie is pretty awful, with it’s terrible plot, action, and dialogue. It’s terrible in so many ways that I almost don’t know where to begin. the plot of the movie is totally uninteresting and dull. The characters are ridiculously stupid. even the action is pretty bad, save for a decent moment every now and again. But there are barely any of those too. the look of the movie is bleak and lifeless. 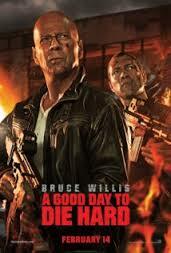 and worst of all, it really doesn’t feel like a Die Hard film in any way. No connection to any other movie in the series, no other stars here besides Willis, nothing to make us believe this is a Die Hard. Instead, it’s more like an awful attempt at taken. This movie is so bad that it’s actually hard to get through. You’ll either fall asleep or wish you had. A Good Day To Die Hard is pathetic. There really isn’t any other way to describe it. The plot is terrible, the action is all ridiculously computer generated and even when it’s not, it’s just absolutely stupid. Nothing about this movie is very good save for a couple of very quick moments. Die Hard is an American classic about a guy who takes on international terrorists while in his home country. To bring it into another country and have him fight crime lords out there is this movies way of trying to turn it into taken. I would have much preferred another U.S. grounded, low-key Die Hard movie here. Something more Like the first film. Put it in a shopping mall, for all I care, but at least keep it on a level where you could see how the movie might have ties to the first film or at least be similar enough to call itself a die hard picture. That first movie, made so long ago, back in 1989 really did take place entirely in one building. And it worked, better than any other movie in the series. So why not put john McClane back in a single building, like a mall, again? Because somebody decided that every movie had to be bigger than the last, and so the second movie took us to an airport, then the third movie took us through the streets of NYC, and the fourth, into the heart of government in Washington D.C. now, with no new ideas left, they decided to just blow a whole bunch of things up in Russia. The result is a mess. At the start of the film, we learn that there is a scientist who is being held in prison by Russian authorities. this man is Yuri, and he’s got some secret information about radiation and documents. None of it really matters. Whatever secrets he knows are simply a Mcguffin (something that eveybody wants, even though it doesn’t really matter what it is, such as the briefcase in pulp fiction.) the bad guys want what yuri has, and so they try to bust him out of prison during his trial. 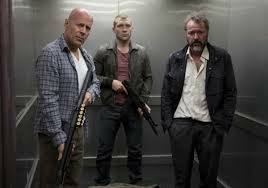 only john mcclane’s son, jack, is there to help yuri escape to safetey and make it out of the building. jack is a cia operative, only john (bruce willis) doesn’t know that. for this reason, when john hears that his son has been arrested in russia, he leaves ny, books a flight, and heads right to russia, himself. you would think that seeing him on a flight, maybe this movie would try to make a connection to the first film, where macclane learned to make fists with his toes after getting off the plane, to help him relax. no such luck. this movie makes pretty much no reference to the other movies, other than having mcclane have a son and a daughter here. the daughter is played by the same actress who played her in the fourth movie, but other than that, there is really no connection at all to anything that came before this film. a cameo by reginald veljohnsen, samuel l. jackson, john’s wife, holly, or the red haired, scummy news reporter from the first two movies would have been nice. I would even settle for justin long popping up somewhere (brought in for the fourth movie.) no such luck. A good day to die hard is so bad that it isn’t even faithful to the trailers. lots of movies put scenes in the trailers that get cut from the final film, but it usually ends up being about one scene. two at the most. after all, a trailer is only so long, and if they’re using it in the trailer, they must have thought it was pretty good, right? i mean, that’s what they’re using to show off their movie. Not so with this film. in the first ten minutes or so of the movie, we get two scenes that were in the trailer and have now been significantly cut. one has the cab driver talking to mcclane, telling him that he doesn’t look like a lawyer, but more like a cop. the dialogue is never heard in this film. the other scene has a female villain strip down out of her motorcycle attire, into her underwear, in the middle of a garage. the scene is shown in its entirety in the trailer, but in the actual movie, it’s just a quick flash that is instantly cut away from. it’s as if they thought they would get in trouble for showing that scene. now i’m not saying that any of these scenes would have been great, or would have in any way made the movie better. i really doubt they would have. but it’s just a matter of not being honest. there’s the scene where mcclane and his son find some guns and talk about a pirate gun, which is old school. that scene is gone entirely. and then there’s the moment during the final action scene of the film, where the two of them go crashing off the side of a building in slow motion, through about three floors of glass. there’s a bird’s eye view shot of them slamming through the glass, that ends all of the trailers, and yet that shot is nowhere to be found in this movie. my problem with all of this is that when you go to see a movie, you always want to see scenes that were in the trailer, that you are expecting to see. my guess is that this movie just had no confidence in anything it was putting out there. it just kept flip flopping and changing its mind about things, to the point where what it once thought were some of the coolest moments in the movie, worthy of putting in the trailer, ended up being cut out of the film entirely. none of this really matters, of course, since the story is terrible to begin with and so is just about everything else in the movie including both awful characters and dialogue. the positives are really minor here. there’s a quick moment during a car chase where mcclane turns his flatbed truck and a missile goes shooting through the air right past it. that second was pretty cool. so was the one where mcclane and his son are on the ground, behind a counter and see that there is a glass ceiling. they unload all of their shots on the ceiling sending mountains of glass shattering down on the bad guys. finally, i was okay with the scene where mcclane held onto a helicopter as it spun him around and then threw him off, so that he went crashing through the window of a building. all of these stunts are ridiculous, of course. these guys fall through multiple floors of things, get into multiple car accidents in a row, and constantly walk away with out a single broken bone. the vulnerability of john mcclane in the original die hard film, running around with bloody feet because he wasn’t wearing shoes, is long gone. there’s a surprise twist at the end, but when we are not invested in the characters or the story at all, who really cares? this movie was designed to make money, and not to be a good film. they should have spent some time getting a decent screenplay together, and should have definitely kept it in the united states. every movie leading up to this one had at least two other name actors, besides bruce willis. the third movie had sam jackson and jeremy irons. the fourth had justin long and timothy olyphant. this new movie has got nobody. cole hauser pops up, but he’s only got about two scenes that are both over in the flash of an eye. the movie really is an absolute waste. i had problems with the fourth film, but this new one is just ridiculous.